Level 1, 186 Greenhill Road in Parkside, South Australia. The fit out involved refurbishing the existing office to incorporate their new business infrastructure, which includes a reception and waiting area, boardroom, meeting rooms and communications room. A large, centrally located staff zone and café hub has also been added to provide staff with an informal and collaborative work setting. This bright and invigorating hub area is linked to the building’s central atrium encouraging staff to connect and interact with each other from across the organization. The front of house introduces a modern clean lined look which proves effective with the company’s corporate branding. 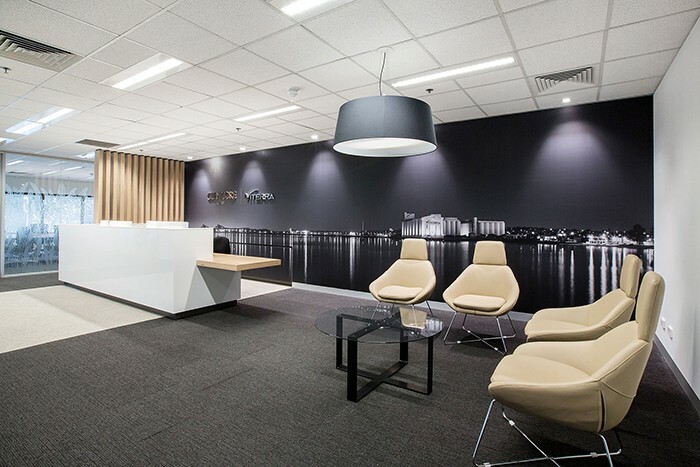 A personal touch was offered for the fit out which involved the client’s site photography produced on digitally printed wallpaper and used on the reception area’s main wall.